Want commercial locks repair? Need to increase the security level at your business? Whenever you need assistance from a professional, talk to us at Locksmith Scarborough, ON! Licensed and trained to repair, install, rekey and change all types of commercial locks, our technicians can assist you with any issue. Did you get yourself locked out? Looking for new office security solutions? Want to rekey one of the office locks? Get in touch with our company for fast response, affordable and emergency commercial locksmith Scarborough, ON, service. security needs of each and every business in the Scarborough area. Whether you own a small boutique or are the manager of a hotel, law firm or shopping center, you can count on our expert services. We can fit the most advanced access control systems in Ontario, install a new master key system, help you find the best possible digital lock, and do lock rekey or repairs. Our company offers commercial, office and industrial locksmith. In other words, we can help you with lock and key issues regardless of your business. From installing combination door locks and replacing the locks at your file cabinet to fixing the door closer and rekeying locks, our experts are at your disposal for all services. 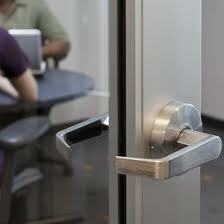 We also offer panic bar repair and can fix issues related to all emergency exits. Is your key broken inside the lock? Want lockout assistance? In case of emergencies, you can still contact our commercial locksmith inScarborough24/7. We extract and replace keys, urgently rekey and repair locks, and fix any problem that will endanger the safety of visitors and employees, or will compromise the property’s security. Burgled? Don’t hesitate to call us to fix the problem. We offer 24 hour commercial locks change if lock damage is irreparable. You can trust the expert knowledge of our technicians and rely on our quick response every time you need reliable, effective, discreet and 24 hour commercial service.